Effective protection to give you all day dryness and balanced with 1/4 moisturising cream to take care of your skin. New and Improved formula, cares for your underarm skin like never before. Dove Original Anti-perspirant Deodorant Stick provides 48 hours protection against sweat and odour. Contains our unique 1/4 moisturising cream for beautifully soft and smooth underarms. Helps delicate underarm skin recover from irritation caused by shaving. Glides onto skin and feels smooth. 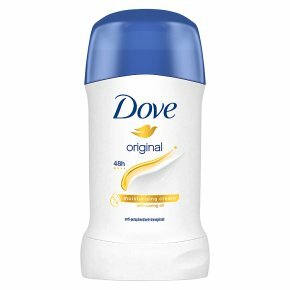 Delicate, subtle scent helps to keep you feeling fresh all day long.Dove Original Anti-perspirant Deodorant Stick 40ml is a long lasting anti-perspirant stick that provides up to 48 hours of protection against underarm wetness and odour as well as offering incredible care for your underarm skin. It's our most skin friendly anti-perspirant ever, providing the reliable underarm care you know and love, helping your underarms to look and feel softer, smoother and even more beautiful than before. The new and improved formula contains our unique 1/4 moisturising cream which helps delicate underarm skin recover from the irritation caused by regular underarm shaving. It's a moisturising deodorant that features the signature Dove scent, which is subtle, fresh and helps you to feel clean all day long. Dove Original is perfect for those who want a classic anti-perspirant and freshness they know they can depend on, with no frills and no fuss. To get the best results from your Dove Original Anti-perspirant Deodorant Stick, apply it to clean, dry skin. Simply apply first thing in the morning to your underarm skin, preferably when it is cool and dry, gliding gently to get even coverage and enjoy underarm skin that feels beautiful and smells great. Then simply enjoy delicately scented, lasting anti-perspirant protection from underarm wetness and odour for up to 48 hours. Easy as that! New and Improved Dove Anti-perspirant - Cares for your underarm skin like never before.